It was stinking hot when the Bermagui crew arrived at Steve's place on Thursday. It had been a long hot ride and a swim and cold beer was much appreciated. Steve and Jenny put on a lovely BBQ for the visiting Kingies and many stories of the trip down were swapped over a few cold ales. Friday started with a cool grey sky and after a breakfast in Sorrento we all met at the ferry terminal to catch the 9.00am ferry to Queenscliff. 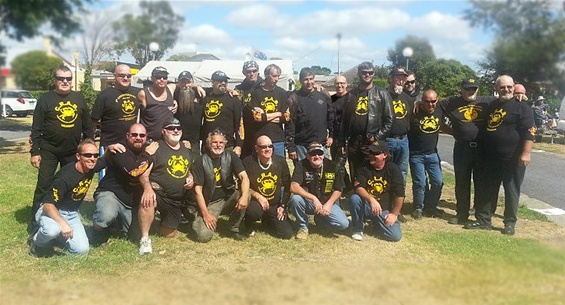 At this stage we had ten bikes and fourteen Crabarians - Rob, Steve, Johnno, Jim, Will, Marcus, Berni, Bruce, Judy, Dennis, Lynn, Doug, Anne-Maree, Tony, doing the run to Warrnambool. The voyage across was smooth and we all enoyed the bay views, although at one stage we were advised by a crew member to stand by our bikes as the ferry was about to cross a container ship's wake, but all was well. There was light rain falling when we disembarked in Queenscliff and after a brief fuel stop in Ocean Grove we headed for The Great Ocean Road. The road was dry and it was very windy in parts but the view was spectacular. We had a leg stretch in Lorne during which time we were approached by a local policeman who was enquiring about what we were doing. We explained what the club was about and how we were on our way to meet some members from Adelaide, and he turned out to be a really nice guy. He offered to take our pic and even gave a ten dollar donation to our cause....how often do the the police give you money, normally it's the other way around! We saddled up and headed to Apollo Bay for lunch, where we found a nice sidewalk cafe and sampled some of the finest culinary delights the Surf Coast could offer..burgers, chips, pizzas etc. After lunch we met up with Steve and Bennie and we headed off. A quick stop at the Twelve Apostles and on to Warrnambool. We arrived at about 4.30 and went to Bruce and Judy's apartment; some stayed there while others dispersed and went on to their separate accommodation around town. We met later for drinks and dinner at the Lady Bay Hotel, where we were joined by Rowan, Angelo and Stuart who had left Melbourne earlier that day. 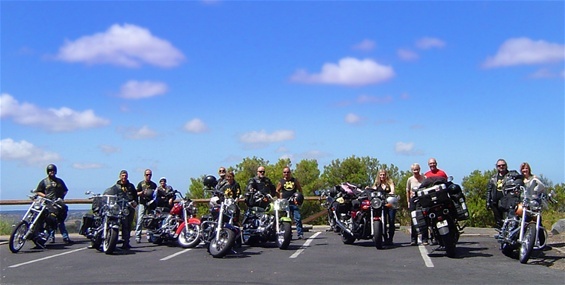 The group had grown to fourteen bikes and nineteen Crabarians. Saturday morning was bright and sunny when we met at The Pavillion on the breakwater for breakfast. After enoying the view and woofing down a scrumptious feed, we headed out toward Mt.Gambier. We had lunch in a roadhouse on the outskirts of town and then rode 100k north to Naracoort to meet up with the SA Blueys. The Blueys soon rolled into town and after a roadside "meet and greet" we headed back to Mt. Gambier. It was quite an impressive sight to see the bikes riding down the road. 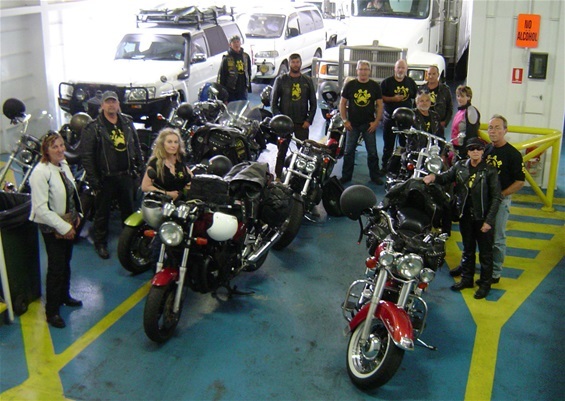 The group had grown to twenty nine bikes and fourty-four Crabarians, including the people in the Blueys back up vehicle. The Hermits and the Kingies checked into the Grand Central Motel while the Blueys went to set up camp at the caravan park, and after a few relaxing ales and some tall stories we strolled off to the RSL for dinner. Rob, Steve and Neil chaired an impromptu meeting with the members to discuss some national issues and then we ate. 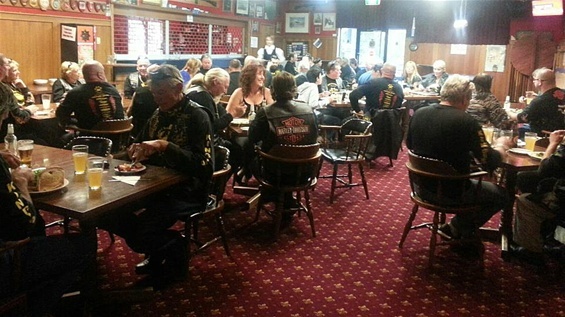 Well done to the RSL for turning out so many excellent meals in such a short time. After dinner we retired to the bar for a few more ales and then back to the Blueys caravan park where Steve and Andrew entertained the group with some music. Unfortunately the caravan park manager was in a very "Basil Fawlty" sort of mood and called the police, which put an end to the festivities. There must have been something in the air that night as another group of Crabarians were accosted by a drunk indigenous Australian who claimed we didn't like him because he was black. We explained that colour had nothing to do with it and that we didn't like him because he was a drunk moron. Once again the police arrived. The Hermits returned to the motel and a few more drinks were consumed in Dennis and Lynn's room, while a female Crabarian entertained us with a new game she had invented. It's a fun game which goes like this - turn the lights out, sexually assault someone, turn the lights back on and pretend it was an accident....what fun!! 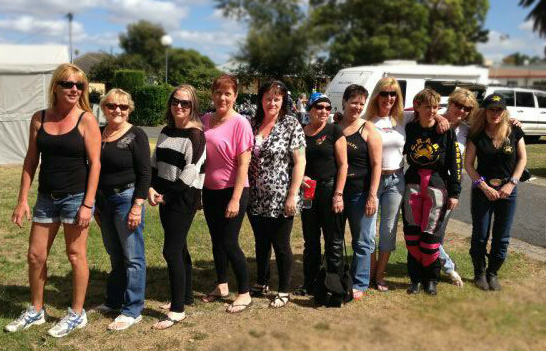 On Sunday morning we gathered back at the caravan park where the Blueys put on a fantasic breakfast in the parks BBQ area. A couple of Hermits didn't quite make it to breakfast as they were still undergoing therapy from the night before but they're doing OK now and the doctor says that the electro shock therapy and ice baths won't be required for too much longer. After breakfast we said our goodbyes to the Blueys and Kingies. Steve, Rowan, Angelo, Tony, Marcus, Berni, Doug, Anne-Maree, Dennis, Lynn, Bruce and Judy then did some sightseeing around Mt.Gambier (the Blue Lake really is blue!) before commencing the ride to Warrnambool. After a lunch in Portland we arrived in Warrnambool at about 3.30 and went to Bruce and Judy's apartment where they put us up for the evening. Thanks for that guys. Dinner was a delicious Chinese banquet. On Monday Doug, Anne-Maree, Dennis, Lynn, Steve and Bennie left early while the others went back to The Pavillion for breakfast and then down the the Hamilton Highway to Melbourne. The ride was great as the road was in good condition and there wasn't too much traffic. We had lunch in the quaint township of Inverleigh and on to Geelong. The traffic on the Westagte and Monash was busy but moving well so we must have just got in before the end of holiday rush. All agreed is was a great weekend and ride. Looking forward to the next one. On the ferry to Queenscliff. Taking a break in Lorne. Leaving Naracoort for the ride back to Mt.Gambier. The Hermits, Kingies and Blueys arrive in Mt. Gambier. Sightseeing at the blue lake.